Finding the ideal employee using a recruitment company like JobFitts is only the first step towards a high-performing team. To create a truly competitive company, you’ll also need to find ways that you can empower and retain that crucial talent. After all, while finding the right candidates can be tough, keeping your employees around can be even harder. A study from SHRM shows that lack of training in the workplace makes it difficult for team members to reach their potential. Without support, your people are less likely to accomplish incredible things, and more likely to search for an alternative role with a competitor. A development plan eliminates those problems by creating engaged, loyal and productive employees. Leverage strengths and address weaknesses: Every employee brings different strengths to a team. Development plans take advantage of those strengths while addressing any skill gaps that might be holding your people back. Attract new talent to your company: People today want more than just a salary from their career, they want opportunities to grow. Show your financial talent that you’re committed to helping them reach their goals, and your employer brand will be instantly more attractive. Improve retention: According to one study, up to 40% of employees with limited training opportunities leave their role within a year. 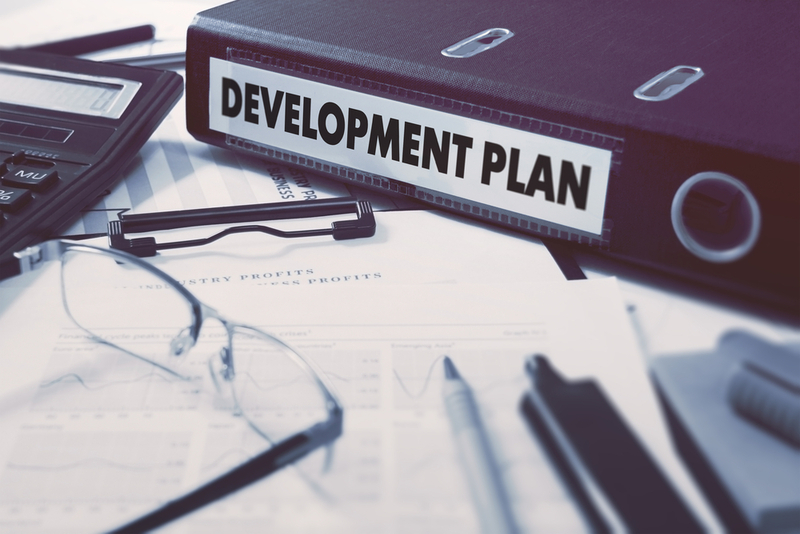 Development plans show your people you’re invested in them, which makes them more loyal to your business. Enhance business performance: Addressing skill gaps will improve the performance of your entire team, and make people feel more satisfied by the work they’re doing. Development plans are a win-win for any organisation. Your company benefits from a more dedicated and motivated team, while your people get to expand their skills and enjoy more of their work. So, how do you implement effective development plans? The best development plans align with both your employees’ ambitions and the objectives of your company. Think about what your short and long-term targets are for the company, then identify the necessary competencies and skills your people will need to support those goals. For instance, if you’re planning a merger that will grow your organisation, you may need to expand your leadership team. Ask yourself what skills those leaders will need to have and whether any of your current employees have the potential to fill those gaps. Some of your staff may already be on their way to a leadership role. Look at where they are now, and what kind of training they’ll need to excel in a new position. This will help you to fill essential gaps faster and show your people that there are opportunities for advancement in your company. If you’ve successfully hired a diverse team, all of your employees will have their own strengths and skills to offer the group. This means that they’ll also have unique requirements when it comes to development. Which tasks they feel most confident with: Does this person feel better working with complex accounts, or dealing with specific challenges? Where they believe they need to improve: Will your forward-thinking financial team benefit from training in new technology like CRM and ERP systems? How they learn best: Are they more likely to respond to a mentor, one-on-one training or group sessions? Once you’ve decided on your business goals, and you know what your employees need from you to accomplish those targets, it’s time to plan your training and development strategies. Working on stretch assignments and special projects. Remember to ask for feedback from your staff after each training session so that you can find out which options seem to deliver the best results. Finally, make sure you have everything you need to activate the development plans for your employees. Choose a timeline for each staff member based on the complexity of their goals, and how their ambitions align with your business targets. Deadlines will give you a way to measure each team member’s progress over time. Before: Make sure your people understand the reason for their development plan, and how it’s going to support them in the future. During: Let your people know who they can turn to for extra assistance if they’re struggling with their progress or need to adjust their development strategy. After: Review how the training session has benefited your employee, and how they can implement their new skills into their role.